The film, which chronicles the ups and – well, let’s be honest – primarily downs of gallows humor-laden folk singer Llewyn Davis (Oscar Isaac, perfectly melancholy and full of piss and heartache), is bathed in the soft muted glows and dark greys of wintertime and 1960’s New York City, strung up wall to wall with amazing folk tunes, and filled to the brim with opportunities and love lost. The Coens, who previously found their hearts tied to music with their blue-grass fueled Southern-fried odyssey O’ Brother Where Art Thou? have never had their love of music tied more closely to their themes – the film (like all of their best films, lest we forget the homespun folksy wisdom of Fargo) is itself a kind of folk song. There are hints of an odyssey here, too, as Llewyn flounders about from place to place struck with bad luck, bad timing and a perpetual failing when it comes to life’s big decisions, and he finds a bit of a kindred animal spirit in a series of cats who cross his path on their own odysseys through life, and one of the felines is not coincidently named Ulysses. The film opens and closes in cyclical fashion with Llewyn’s rendition of “Hang Me, Oh Hang Me” at the famous Gaslight Café. In between he gets caught up in a love triangle (that never really was a triangle, just a mistake) with the more popular and commercially promising folk duo Jim & Jean (played in pitch perfect fashion by a remarkably calm Justin Timberlake and a piss and vinegar version of the unfathomably cute and internally spitfire Carey Mulligan), has his lights decked out (twice? forever?) by a man in black hat in an alley, is berated by his sister, bounces from couch to couch in Greenwich Village, and takes a surreal road trip to Chicago with a chain-smoking beat poet named Johnny Five (Garrett Hedlund) and a pompous jazz musician named Roland Turner (played with hot air gusto in perfect fashion by frequent Coen cohort John Goodman). All along a ghost hangs over the film, Llewyn’s former singing partner we know only by name and one song (“Fare Thee Well”) as Mike, who threw himself off the George Washington Bridge not too long ago. “People should throw themselves off the Brooklyn Bridge not the George Washington Bridge,” Roland Turner muses with a poignant heartlessness. 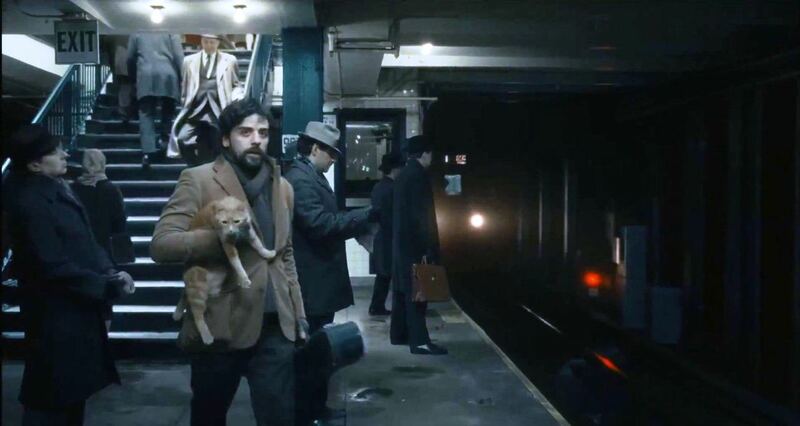 Inside Llewyn Davis is the Coen Brothers most honest film in quite some time. There’s no sense of judgment here or any hints of farce. They allow their characters to make their sweet music and let the audience luxuriate in the dulcet tones. The pacing, the tone, the cinematography (from Coen Brothers first-timer Bruno Delbonnel), the editing, the sound design, the acting, the music…everything is spot on, polished, professional – their most fully realized period and mood piece since they made a kind of folk song out of 1930’s gangster films with Miller’s Crossing – hard to believe – nearly 25 years ago. Meanwhile, Llewyn has scripted banter after the end of his performances where he says, “If it was never new and it never gets old, then it’s a folk song.” You could say the same thing about a great Coen Brothers film. Inside Llewyn Davis is certainly one of those. This entry was posted in Art-house Cinema, Inspiration, Movie Reviews, Movies, Music, Pop Culture and tagged Bruno Delbonnel, Carey Mulligan, Ethan Coen, Folk Music, Garrett Hedlund, Gaslight Cafe, Greenwich Village, Inside Llewyn Davis, Joel Coen, John Goodman, Justin Timberlake, Llewyn Davis, Mood Piece, New York City, Oscar Isaac, Period Piece, The 1960's, The Coen Brothers. These brothers are amongst my favorite living filmmakers – so we gotta do a ranking, no? Wow we have a major, major divergence on NO COUNTRY FOR OLD MEN David. You are one of the first persons I have every met anywhere who has not loved or at least liked this film. Wow. I will forever be reminded of its mediocrity as it will always be the film that beat THERE WILL BE BLOOD for Best Picture. UGH! It shouldn’t surprise Sam that the second person he’s met who doesn’t like No Country for Old Men is Me. As far as Inside LLewyn Davis, I could have sworn I already read your take on this movie and you had said you didn’t like it which made me sad because I think it’s a really terrific movie, one of the Coen Brothers’ best. It ranks right up there with Fargo and Miller’s Crossing for me. I find the ranking hard because I usually get egged. Not only did I not like No Country for Old Men, but I didn’t like The Big Lebowski either. When people hear that they examine me for several seconds like an exhibit at Ripley’s Believe It or Not. Top Movies: Fargo, Miller’s Crossing, Inside Llewyn Davis and maybe Barton Fink. Second Tier: Raising Arizona, Blood Simple, O Brother Where Art Thou, Burn After Reading, and maybe A Serious Man. Their Worst–the one’s I never want to have to see again: The Big Lebowski, No Country for Old Men, True Grit, The Man Who Wasn’t There, Intolerable Cruelty. I can’t rate The Hudsucker Proxy and The Ladykillers. I either didn’t see them or don’t remember them. Jason – oh, man oh man, I think both No Country and Big Lebowski are criminally overrated too, and they are amongst the common favorites of most folks when asked to rank the Coens. I do have to ask though, what is your problem with True Grit? Perfectly harmless, handsomely made film. Glad you loved Inside Llewyn Davis, and I’m offended (just kidding) that you imagined I didn’t like it! I’m a little disheartened to see some of the bad reactions to Inside Llewyn Davis, but I am glad to find you are not part of that group. As far as True Grit goes,I didn’t remember why I didn’t like it so I went back and read my original review and the string of comments. Wow. I was a jackass to the Coen Brothers back then. I was probably harder on them than I should have been. I don’t know if I still think they make pointless movies, but I stand by my appraisal of True Grit. I thought True Grit was empty and pointless. The irony is many people are saying the same thing about Inside Llewyn Davis, but I think there’s a difference between stylized nihilism gussied up as art and a thoughtful examination of a disconnected and discontented artist. Llewyn Davis is the latter, as far as I’m concerned. True Grit, the former. It left me cold (no pun intended). Then again, it has been a while, so maybe I’ll revisit it. Based on the three you would put at the top, I would recommend starting with Barton Fink, then Miller’s Crossing. They are very similar in style and tone to those other three and impeccably well made. Blood Simple is an acquired taste I think – highly recommended but it’s a very certain “type” of Coen Brothers film – so I would save that one for when you have the time. Same with Raising Arizona (much more of a comedy than Blood Simple) – an acquired taste. Also… I think True Grit ought to be included in the upper ranks of that list too. Blood Simple 7/10 The type of film they would return to a few times in their career (and improve). Raising Arizona 5/10 Unfunny IMO and excessive in its mannerisms. Miller’s Crossing 8/10 At times it feels inauthentic period and drama wise, but still worthwhile. Barton Fink 9/10 Really explores the plight of the artist very well. The Hudsucker Proxy 5/10 Only saw this once and have no desire to return. Fargo 7/10 Does not reward multiple viewings. The jokes are one note and repetitive. The Big Lebowski 9/10 A great Raymond Chandler/Big Sleep sendup. Extremely funny. O Brother, Where Art Thou 7/10 Great music, but the movie feels like middlebrow Coenisms. The Man Who Wasn’t There 10/10 Their deepest film and an ode to Camus. Intolerable Cruelty 5/10 One and done. No desire to investigate a second time. The Ladykillers 5/10 Read the above capsule for same opinion here. No Country Of Old Men 10/10 A masterpiece of thrills and profundity. Every element is perfect. Burn After Reading 7/10 Better than it’s reputation, but nothing to stand in awe of. A Serious Man 9/10 Incredibly deep study of man’s futility in dealing with misfortune. True Grit 8/10 Hugely entertaining film, but a second viewing revels gnawing emptiness. Inside Llewyn Davis 9/10 A success. Coen’s pull apart the suffering artists plight.